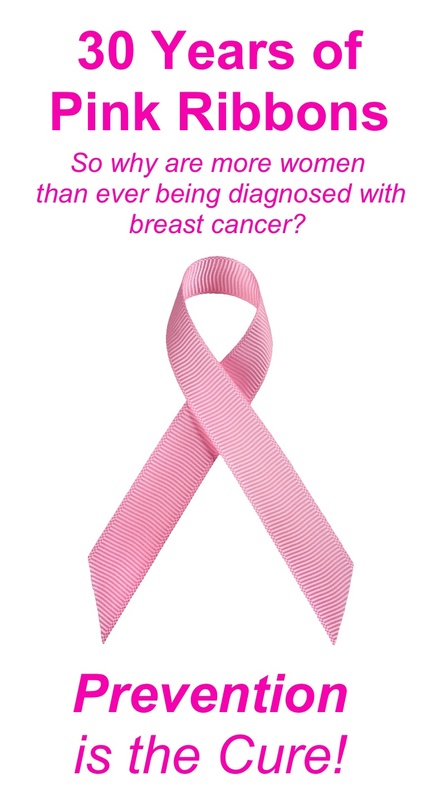 Thirty Years of Pink Ribbons - Is It Working? The pink crusade has been going on for three decades now. Pink t-shirts, pink balloons, pink ribbons—hundreds of millions of them—every October, year after year for thirty years. Fundraisers and events with pink tablecloths, pink centerpieces and napkins, pink cupcakes and pink drinks. Survivors and their families – women and men – walking mile after mile in memory or in honor of a loved one. Consumers purchasing millions of products bearing the pink ribbon symbol, hoping that a portion of their money will help find a cure. Awareness has certainly been raised. 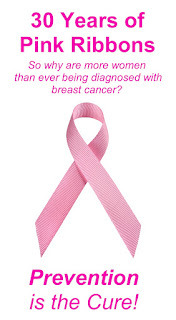 And yet we are diagnosing more women (and men) with breast cancer than ever before and at younger ages. How is that possible? Corporate America has become a significant sponsor, turning everything pink from airplanes to oil delivery trucks in the process. "Cause marketing" they call it. These corporations promise to make a contribution to "find a cure" if you buy from them, but at the same time, many of them make products containing chemicals and hormones that may actually increase breast cancer risk. Synthetic estrogenic compounds (chemicals that mimic estrogen in the body) pervade many consumer products, including many cosmetic and personal care products that women use everyday. It's frustrating to think how many women shampoo their hair, roll on some deodorant, apply their makeup and grab a bagel with cream cheese along with a cup of coffee with hormone-laden milk on their way to a breast cancer march without ever thinking that some of the things they just put on their body or swallowed can be linked to an increased risk for the disease. There is some good news. Organizations like the Silent Spring Institute, Breast Cancer Fund, Breast Cancer Action (and their fantastic "Think Before You Pink" campaign) and local New York-based groups like Great Neck Breast Cancer Coalition and Huntington Breast Cancer ActionCoalition (HBCAC) are leaders in the movement to focus the public’s attention on prevention and the role of the environment in the development of breast cancer. Huntington Breast Cancer Action Coalition uses the slogan “Prevention is the Cure,” and they're right! Time to follow their lead. The transition from theory to reality can be pretty shocking. At least it was for me as I stood by the side of the road last week near the Indian Point nuclear power plant in Westchester, NY, watching a giant machine take down 100-foot trees like they were matchsticks. It was horrific, and it was real. The noise alone was amazing. The giant saw blade made an incredible buzz, the diesel engines roared, and the falling trees crunched and moaned as they fell to the ground. One after another, the mature trees fell, as one solitary machine operator relentlessly moved his giant rig deeper into the woods. The trees were being cut down to make way for the new 42-inch gas pipeline that will traverse Westchester County as it transports natural gas from fracking operations in Pennsylvania to export terminals in the Canadian Maritimes. We've been talking about this possibility for years. But now the destruction has actually begun. I was in Westchester to survey the route of the proposed pipeline, getting ready to shoot video for a documentary film we're making. Luckily I had my camera in the car, and was able to document the destruction of the trees with a short film. As I watched the mayhem, I thought about industry executives and their lawmaker partners who champion the job-creating aspects of the natural gas delivery build-out. Sure, I thought, the guy taking down all the trees has a job. And the three truck drivers waiting to haul them away had jobs. But for how long? What kinds of jobs are these, that enable this kind of environmental tragedy? Our film will be about the irony of building a massive natural gas transportation infrastructure at a time when climate change is causing so many problems around the world. Who is it, exactly, who is pushing the natural gas export agenda? Who thinks it's OK to plunder our resources, exploit our environment and pollute our air and water so that they can personally make a big profit? I want to know who's responsible for this. And I plan to find out.